On October 12, a March and Rally to End the Bus Strike by Supporting Workers was organized by the Student and Worker Coalition for Justice (SWCJ) at UC Santa Cruz. 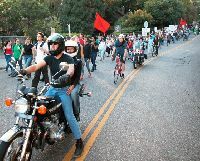 The demonstration began with a rally at the base of UCSC followed by a march to the Metro Center in downtown Santa Cruz. Bus drivers who were rallying at the Metro Center were very happy to see such a large group of people marching in solidarity with bus drivers. 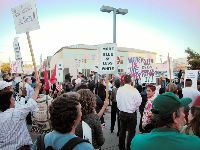 On the evening of October 6, a solidarity rally for sriking bus drivers was held at the downtown Metro Center. Members of a whole range of unions spoke about their support for the bus drivers. Tim Fitmaurice, a member of the city council, expressed support for the bus drivers. Javier from the Student and Worker Coalition for Justice (SWCJ) at UCSC spoke about support from the students. Emily Riely was the only member of the Transit Board at the rally.